Every year our intrepid supporters travel the globe to raise money and awareness for Rowcroft Hospice – literally ﬂying our ﬂag in foreign lands! 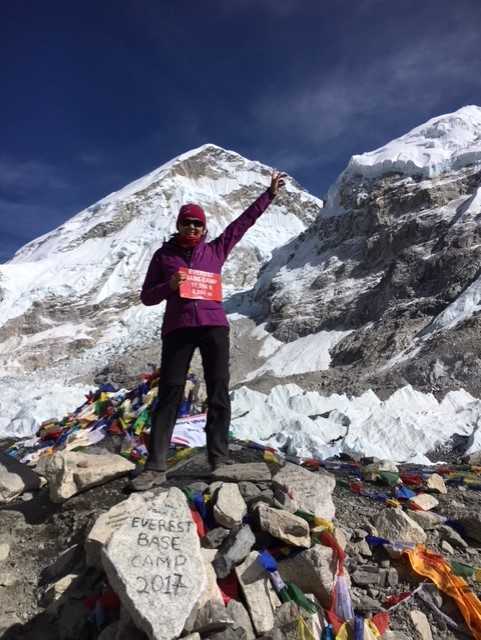 Jane Holloway decided to take part in one of our most extreme challenging adventures – trekking through Nepal to Everest Basecamp which is found at 5500 metres – in honour of her Dad who was cared for by Rowcroft Hospice 20 years ago. She told us about her experience, adding that the trip had been an incredible test both physically and emotionally and was a wonderful adventure. “After months of training – which consisted of long walks along the South West Coast Path and Pilates to strengthen my core – I met up with my fellow travellers at Heathrow. Twenty four of us, with a leader, deputy leader and a doctor, ﬂew to Kathmandu. From there we ﬂew in a tiny aircraft to Lukla – feeling a huge sense of relief when we landed safely on the famously short mountain-side runway! Our trek began as soon as we got oﬀ the plane. Mountain weather is notoriously ﬁckle but we were wearing lots of layers and carrying rucksacks. Because of the altitude we had to keep hydrated so carried lots of water, even so lots of our group struggled. We stayed in tea houses – basic wooden lodges oﬀering a place to stay and a warming meal. They have wood burners in their central eating rooms, but the bedrooms were very cold so I was glad of my thick sleeping bag! Because the trekking was so exhausting I slept well at night. We were really lucky with the weather, it was sunny every day and we trekked through beautiful valleys, rhododendron forests, pine trees and crossed glacial rivers, hoping not to meet a yak on the swing bridges! Everywhere we went we were struck by the friendly spirit of the local Nepalese who greeted us with smiles, waves and calls of ‘namaste’. We were accompanied by Sherpas who very subtly kept us all together, walking with those who were struggling and never letting anyone get left behind. On the 5th day we stopped at the Sherpa capital of Namche Bazaar, where there were shops, markets, cafes and wiﬁ. You could get absolutely everything you needed there, including trekking equipment if you’d left anything behind. It was a great place to spend the day acclimatising. Along the way we were spoiled with dramatic mountain views and monuments dedicated to climbers and Sherpas. We went slowly, because of the altitude, and it was tough. Our oxygen levels were closely monitored by the doctor, and eight members of our party didn’t make it to base camp for health reasons. After ten days, despite the headaches and a cough, I was lucky enough to be declared ﬁt enough and I’m so glad I was able to achieve what I’d set out to do. I can’t explain the emotions I felt when we reached the top of the ﬁnal climb, but it was a real mix of relief, euphoria and a huge sense of achievement! By Day 16 we had retraced our steps back to Lukla where we celebrated our success and said goodbye to our wonderful guides and Sherpas. Best thing: The people! Getting to know our team and working together, made all the diﬀerence; the camaraderie between us spurred us on. Meeting the Nepalese villagers who were all so smiley, friendly and hospitable; it was wonderful to get a glimpse of their life, travelling on foot with heavy loads or using yaks or horses. Don’t limit your challenges – challenge your limits! We have a whole host of thrill-seeking challenges available. If you think you’ve got what it takes visit our challenge page to find out more. Jane travelled with Discover Travel.